Dr. Norman Vincent Peale wrote “The Power of Positive Thinking” sixty-five years ago. There are over five million copies in print today because everyone, no matter their age, understands the value of thinking positive. Happiness is dependent to a large extent on thinking positive, and this is especially true when one becomes a senior. Aging has its own set of issues, fears and challenges. It can become easy to focus on the negative aspects of growing older, especially if someone is lonely, has a chronic illness or is in pain. Studies have shown that how a senior looks at life can truly affect their age expectancy. 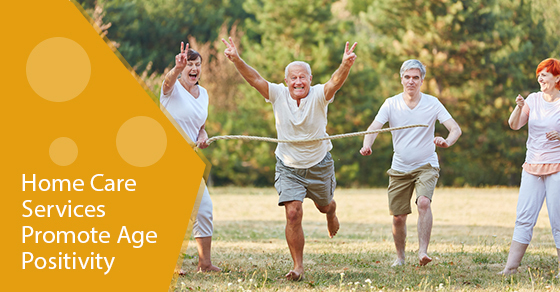 Those with a positive feeling about aging live 7.5 years longer than those that don’t. Exercise on its own only increases life expectancy by 3-4 years. Using a home care service like C-Care Health Services can make all the difference to an aging member of your family. Sometimes all it takes is a distraction from negative thoughts and beliefs to creating an atmosphere of gratitude and lightheartedness. A home care service professional can engage a senior in their favourite hobbies and interests. Whether it be reading, knitting, or playing cards or board games, they have the opportunity to shine and feel worthwhile again. Seniors love to do many things, such as talk about their grandchildren, attend family gatherings and show off their gardens. These positive conversations and interactions distract them from any negative circumstances and can lead to feeling happily productive once again. It is understandable that seniors may get depressed about becoming forgetful, unable to cook all their meals or handle their day to day chores like they used to. A home care service can provide the needed support and alleviate negative and discouraging thoughts. Many seniors are anxious and fearful about moving from the comfort of their own home. Keeping positive about growing older requires a feeling of independence. You can remove that anxiety and preserve their dignity by having a home care service to support their individual needs. It is natural to lose friends and spouses as we grow older. Many seniors have a growing sense of loneliness. Before this devolves into depression, you can counteract the situation with a home care service that provides compassionate and individualized attention to your loved one. We can all get lonely, depressed and feel discouraged over our lifetime. Unfortunately, a senior faces multiple aging issues, making this more of a challenge. Give your aging family member a positive and affirming outlook on life. Choose a caring home care service to enhance their life and promote an age positive outlook..